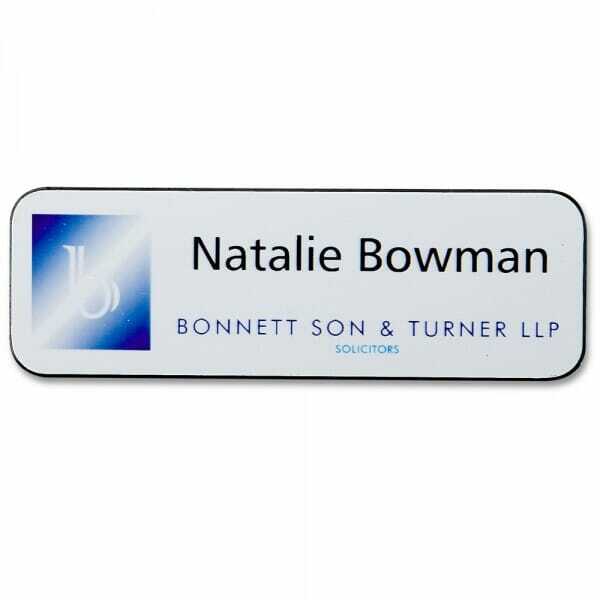 These practical and customisable full colour plastic badges are easy to read, durable and can be created using company logos, business details or custom artwork. The standard badge specification provides all sizes up to 75 x 40 mm (up to 5 lines) with straight edges and rounded corners. Other shapes available include oval, half oval, circle and half circle. Choose from a variety of different colours and materials to create a badge that fits your needs. Badges are supplied with a pin fastener as standard, but can alternatively be supplied with magnetic or combi clip. Customer evaluation for "Personalised Name Badge with full colour print - 75 x 40 mm"